When was the last time I posted entry in this blog? Owh I forgot already, but I’m sure it was around exam period of last semester. Now I’m in the middle of the 3-month break before going back to the campus in Kuantan. A friend of mine calls it KuanHutan which to me may sound offensive but it’s true but funny too! Whatever the conditions and difficulties that my colleagues and I faced during our first experience living there, we’ve been successful to go through the days. It’s not those that really matter, but most importantly is the value that we learnt from them that made us tougher and more mature day by day. Now I feel like missing the campus, or more precisely the conditions in the campus. It’s true, not many people are there unlike Gombak campus. It’s true the public transport allegedly provided there is actually not easily reachable. I can list all of the dissatisfactions here but I choose not to because it’s no more important to look back. It’s just that I, and surely all of my kulliyyah-mates hope that the facilities will be better next time when we get back there this July. I want to say sorry for those who always meet disappointment when visiting this blog and found that there’s no new entries here especially Kak Ila (I’ve been “scolded” by her for not updating this blog actually.. hoho…) and other Gubu friends around the world, and if any, those silent readers who co-incidentally encounter this blog by searching the word “pocong”, “pontianak”, “hantu” etc. I always check the statistics installed here and those are the most popular words searched by readers who visited here and then they ended in this entry. If I have missed any tag appointed to me, please let me know. And if I’m not mistaken Kak Ila wanted to know how my desktop background looks like. Refer below for the picture. 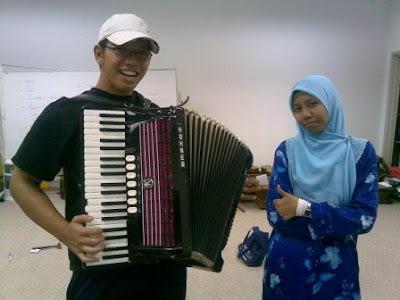 Apart from that, I still keep my promise to Ihab who is eager to know my comments on Kak Ani’s Lenggok 20 tahun album. Ok, after this I’ll write about it ya Ihab? During Angklung performance at KL Tower. More info, read IAC's blog. At KL Tower before going up to the upper level from Restoran Berputar. Owh Kak Ila this is for you~ Does this explain you anything? She's cute isn't she? 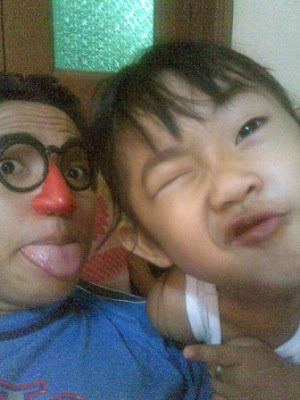 She's my cousin's daughter named Fatin. Went to Bro Kamarul (from Biotech Dept. 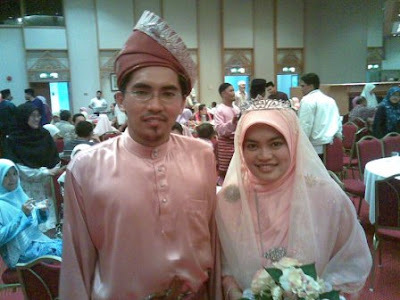 of KOS) and Sis Aishah's (my lecturer) wedding. Again no caption. It's just that I love this picture. With Faxa, a member of Angklung Club. With Pak Dadang before performance @ KL Tower. With the guys of Angklung Club. From left: Asmawi, Fiza Hanif, Me, Jay and Sukri. owhhh..sangat kiuttt..yr desktop backround.since when u having d thing?err..kureng faham ler..maksud d sebalik pic t'sebut. owhh..smemgnya akak marah dgn kmalasanmu..kerna entry dah lama x b'update. mak aih.. blom sejam usia entry ni akak yang sorang ni dah menerjah! terpulang la akak nak tafsirkan ape bagi desktop bg tu.. yang pastinye, asal ade je gamabr2 baru yang cantik n memorable, saya akan jadikan desktop bg. ha.. lama benar cik abg ni berhibernasi, baru skarang nak update blog sendiri ek?? !